Google has begun the global roll-out of a technology which enables firms to "google" their own networks easily. The search firm, recently floated on the Nasdaq stock market, says companies will soon discover search as a "critical business function". This could kickstart the corporate search market, now worth just $500m. But the new "Google in a box" solution carries its own hazards, making all documents on an intranet visible to all, unless security steps are taken. 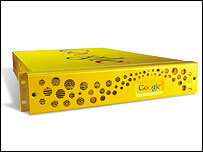 Google's technology comes in a shiny bright-yellow box, which slots into a company's server racks. The search engine inside is similar to Google's own web search technology, tweaked for the enterprise market, and runs on an Intel computer running a version of the open-source Linux operating system. However, it is not new. For the past two years, customers in the United States have already been able to buy their in-house Google. Google says that after some fine-tuning the technology has "matured". Even large companies should be able to index and search their sprawling intranets within a few hours of switching on the Google search appliance, which can recognise about 250 different file formats. Users of these intranets - websites that are visible only within the company - will get their search results in a format that is very similar to Google's traditional internet search, including small excerpts from the documents found and links to cached versions of the documents listed. The appliance can also be deployed as a search engine for a company's public website. And those who want to avoid the Google 'look and feel' can customise the software. The launch comes days after Google launched a free software tool that allows users to index all the information on the hard drive of their personal computer - from e-mail to all kinds of documents. But the desktop search does not reach corporate networks. "A lot of the world's information is not public but behind firewalls in private networks," said Dave Girouard, the general manager of Google's enterprise business solutions at the European launch of the search appliance in London. He happily quotes surveys that suggest that in some knowledge-driven companies workers may spend a quarter of their time looking for information, while poor search facilities on corporate websites are a sure turn-off for potential customers. And without naming names he takes swipes at the "poor quality of search results" and the "long expensive installation" of rival products. Investment bank Morgan Stanley, for example, saw the number of internal searches grow eleven-fold once Google's search technology was added to the company's network. And even though the market for enterprise search is small right now, Mr Girouard expects it to take off once companies realise how search can make their workers work faster. The Google appliances are aimed at medium-sized and large corporations. The most basic version, which allows to index about 150,000 documents, costs £19,000 ($34,000)for a two-year license. Larger versions, dubbed "Mama Bear and Papa Bear" solutions by Mr Girouard, come in clusters of five or eight search boxes and can handle up to 15 million documents and 1,000 queries a minute. In the US market Google's licence fees for such heavy-duty search applications start at about $660,000 (£370,000). But there are security risks too. Once a whole intranet is indexed and cached in a Google server, it presents a neat takeaway package of a company's secrets. Server room security suddenly becomes even more important - although Google's David Bercovich hastens to point out that somebody stealing the yellow Google box would find it very difficult to extract any information from the machine. The other problem is information awareness. Every document can easily be found. Firms that don't have proper security systems in place that clearly define who is allowed to look at which documents might suddenly find their workers googling for terms like "salary". Splitseconds later they might find a spreadsheet detailing the salary details of the management team, which used to be hidden away in a little known corner of the intranet. Google says its search engine links in with various software applications from other vendors that regulate access to sensitive documents. Workers will only get search results for the documents that they are actually allowed to see. Firms or institutions that have failed to put such basic security in place, might find themselves in trouble. Another drawback: The system can only return documents that can be found using an http or https address on the network. This takes many customer relation management systems out of the equation. But Google's Dave Girouard promises that his developers are "working hard" to make it possible to search all the information available in a company.